All-new Ford GT will make its European racing debut at the opening round of the 2016 FIA World Endurance Championship in April. 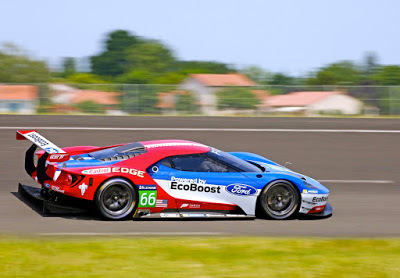 Ford’s all-new GT racecar – revealed at Le Mans in June – will make its European racing debut at the Silverstone Circuit in the U.K. next April. Two cars will line up on the grid for the opening round of the 2016 FIA World Endurance Championship (WEC) where they will compete in the GT-Endurance Pro Class for the Royal Automobile Club Tourist Trophy. Based on the all-new Ford GT supercar unveiled in January and powered by the same Ford 3.5 litre EcoBoost engine, the Ford GT race car is engineered from advanced lightweight composites featuring carbon fibre for an exceptionally rigid but light chassis. Both the race car and production car will arrive in 2016 to mark the 50th anniversary of Ford GT40s placing 1-2-3 at the 1966 24 Hours of Le Mans. Ford went on to repeat its victory at Le Mans in 1967, 1968 and 1969. As well as competing in the full 2016 FIA WEC, the GT Race Car will contest the IMSA WeatherTech SportsCar Championship (WTSCC), making its global competition debut in January at the Rolex 24 in Daytona, FL. Drivers’ details will be announced later.